I love grilling season. Which, where I live, essentially lasts from mid-February to mid-November. During the summer, the Jason’s “vegetable” of choice is grilled corn. It could be worse, I guess – although lately he and Landry have really been digging the grilled green & purple beans from the garden. His grilled corn on the cob usually comes slathered with a compound butter flavored with basil and parmesan or Mexican-style, slathered with a chipotle butter and topped with a pinch of crumbled queso fresco. So when I saw a recipe for grilled broccoli with chipotle-lime butter in the latest Food & Wine, I was completely smitten – and pretty optimistic that I could get by with swapping out the corn for broccoli without too much protesting. The broccoli was lightly charred and smokey. The chipotle-lime butter added volumes of flavor and just a little heat. My husband declared it the best broccoli he’s ever had, which, honestly, probably isn’t saying much. But I think it was one of the better preparations of broccoli that I’ve ever had. And I love broccoli! Trying not to negate all the good, I only used half the butter that the original recipe called for and squeezed extra lime juice over top before serving. And just like that, everyone in this house enjoys broccoli. 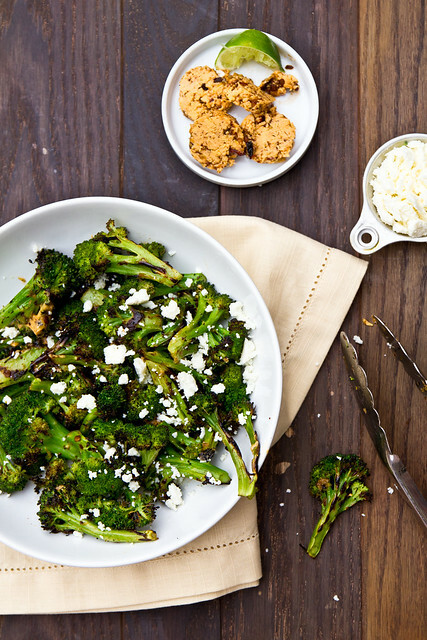 Grilled broccoli topped with a flavorful chipotle-lime butter and queso fresco. Grill ~10 minutes, flipping or stirring halfway through - the pieces should have nice grill marks but not be too charred. What a great idea, I bet the grilling gives the broccoli a really delicious flavour and there’s nothing better than a kick of spice to go alongside that! Yum! We love, love, love broccoli – a new preparation method is always welcome. Love asparagus and green beans on the grill, so I know that we’ll just love this one! I’ve never thought of grilling broccoli – what a fabulous idea! Broccoli is definitely one of my favorite fiber-licious veggies and it is so nice to see a new way to prepare it. 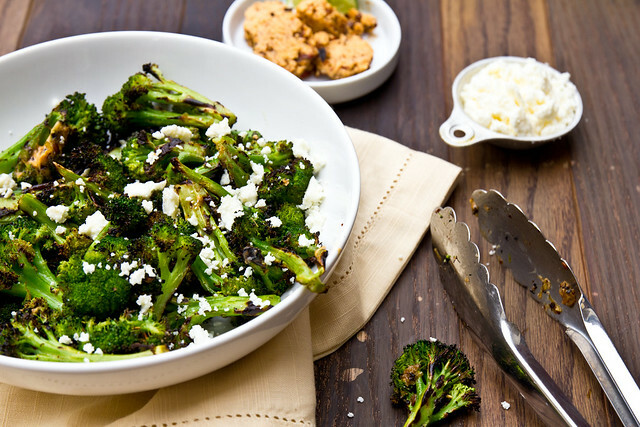 Just when I thought grilled broccoli couldn’t get any better… I’m trying this soon! This recipe sounds fantastic. I’m printing it and trying it ASAP. Wow, this looks and sounds amazing!!! Can’t wait to try it. Way to go! I got my dad hooked on queso fresco when i was home for mother’s day and I think my next step is to use THAT addiction, combined with this fab recipe to get him to eat broccoli. win. I might actually get my family to eat broccoli this way! 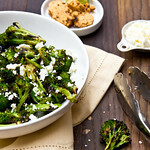 I love roasted broccoli, so I can only imagine that grilled broccoli (esp with chipotle-lime butter) is even better. Really can’t wait to make this!! Sounds yummy! What is adobe sauce? When you buy the canned chipotles, they come packed in “adobo” sauce. That’s what you want! Sweet Jesus this looks good. Going on the must-try list! As a strong adherent to all things broccoli, I am kind of appalled that I haven’t grilled it before. This is certainly inspiring! Made this tonight – LOVED it. Thanks so much for sharing!!! Wow, never thought to grill broccoli. Once I get my grill out, I’m definitely trying this one! Thanks for sharing! We made this tonight with some burgers – it was amazing!! It will definitely be a repeat. And the chipotle like butter – cant wait to use that on different veggies! 🙂 Thanks! I love grilling or roasting broccoli, the brown crunchy parts give it so much more flavor! Just made this for dinner. I roasted broccoli and carrots and topped it with the butter. I even used the butter on top of some grilled chicken, and I think that was my favorite part. Definitely a keeper!